Difficulty eating or walking, overreaction to noise, stiffness, elevation of the 3rd eyelid. Often fatal; fever, staggering, circling, head pressing, depression and sleepiness. Not contagious, but spread by mosquitoes. Rarely fatal; cough, loss of appetite, fever, depression, muscle soreness, discharge from the eyes & nose. Very contagious; keep affected animals isolated. Respiratory distress; nasal discharge, cough, fever; causes abortion in pregnant mares. Fever, swollen jaw glands, loss of appetite, cough, nasal discharge, can cause abortion in pregnant mares. Lethargy, anorexia, fever, colic, laminitis, colitis, and diarrhea. Spread during insect season, vector unknown. A horse's normal body temperature is 99 - 101 F.
The normal pulse rate, most often taken by listening to the heart on the left side of the chest just behind the left elbow, is 36 to 42 beats per minute. Young stock & ponies tend to be a bit faster. and the response rate. 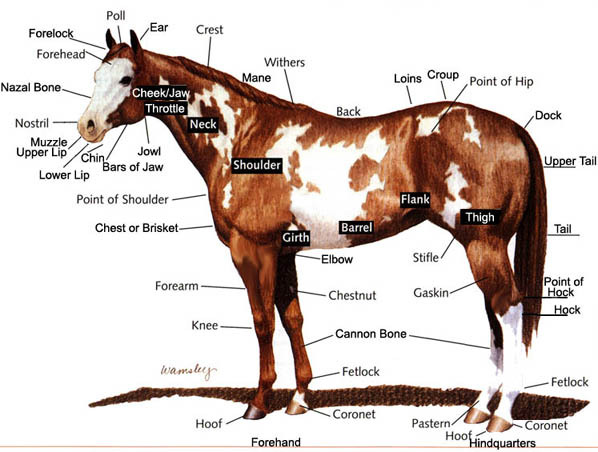 This page is to educate you on a horse's vital signs. care of them, and aid you in knowing when to call a vet. parameters of your horse that can be essential in your assessment of his health. determining how quickly he needs veterinarian assistance. the horse is ill. Horses are never "just not hungry." a normal reading for him. The normal temperature for the horse is 100.0 degrees. if he is running a fever from an infection. as any exercise, can often raise the core temperature upward even without a fever. This must be taken into account when the assessment is made. at least 3 minutes. Many digital thermometers work well in less than 1 minute. especially if used on an ill horse, to prevent the spreading of an illness. side of the chest just behind the left elbow, is 40 beats per minute. if it comes down, before recording the final rate. Respiration: The normal rate for horses is between 8-12 breaths per minute. Pale: Low perfusion of blood indicating a "shock" condition. Deep red: Congested membranes, also a shock type condition with toxicity. Purple or blue: Low oxygen levels or serious toxicosis. Borborygmus: This refers to the sounds that the gut makes in digesting the feed. determination of what can be considered "normal", "none", "low", or "hypermotile." deteriorating. Take this, and all of the vital signs, frequently. considered healthy will help determine if this is abnormal. of concern and the response rate.